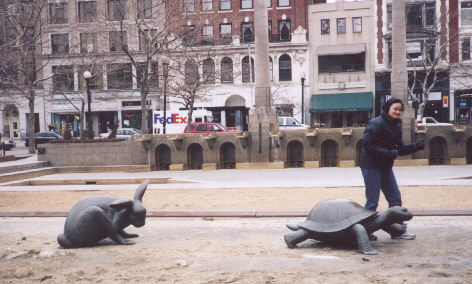 On March 10, my friend Murd and I went to Boston, Massachusettes. We had been talking about this for ages and had been planning for ages, so needless to say we were both really excited. I could not sleep and actually ended up sleeping for 3 hours. My dad dropped me off to Murd's place at 5:30 in the morning and then from there we took a cab to the bus terminal downtown. We took the Greyhound down to Boston - it's 13 hours, with stop overs in many places - St. Catharines, Niagara Fallls, Buffalo, Syracuse, Albany, Newton, Worcester and then finally Boston. We arrived in Boston at around 8 pm. By the time we got there, I was getting really antsy and just wanted off the bus. We took the T to Murd's friend's place. We were feeling adventurous. It's funny because we kept on going on about how we were on the T. You have to be a NK fan to understand. We dropped our bags off at his appartment and then went to Legal Seafoods for some famous New England clam chowder. To be honest, I wasn't that hungry, as I the long journey on the bus really tired me out but we went anyway. I wanted to try the Boston scrod, but didn't feel like anything breaded, mainly because I was quite full already. So I got this shrimp linguini and the clam chowder. It was quite expensivel. I believe I spent about $25 US. That's more than I ever spend here. On Tuesday, we went to Harvard. This was a dream come true for me. 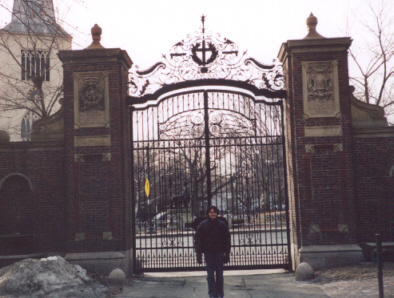 I have always been fascinated by and have wanted to check out Harvard. We walked around Harvard Yard and some of the stores in the area. There were student led tours being offered for free, but we had missed the one at 10 am. So we had to wait for the one at 2 pm. The tour itself was great. Our guide was really funny and interesting. He gave us a lot of history about the university and about life there from the student perspective. I miss being a uni student. After we went to Boston Common and then Cheers which was great too. I used to love the TV show and grew up watching it. Murd and I kept singing the Cheers theme song on the way there. We would later continue to sing the theme song for the rest of our stay there, as well as other assorted Boston related songs (NK) and some current hits. The Cheers at Beacon Hill is what the show is based on from the outside, but the inside is different. Anyway, it was really cool. I had the Cheers rootbeer, and cheeseburger. It's not that expensive either.. about $10. You would think that they would hike up the prices because it's so popular. I bought souviners for my friends and family. Wednesday, we went on a trolley tour. Again the guides were great - really funny and knowledgeable. We did a full loop around the city and then got off at the Bunker Hill monument and saw a multimedia presentation, which was quite boring to be honest. After the presentation, this guy gives a brief talk. And I just found myself being bored, but I think it's because I was tired. The USS Constitution was closed unfortunately, so that sucked. The Boston Tea Party ship was closed too. I had been looking forward to seeing these specifically because we had just finished covering the American Revolution a few weeks ago. We walked to the Bunker Hill Monument though, following the Freedom Trail (a red brick path.. I actually didn't imagine that it would be an actual brick path in the sidewalk) and then made our way to the Italian area in the North End. We went to Mike's Pastry, where everyone says you have to go for the canolis. We got some canolis which were amazing. After, we walked to some of the other historical sights on the Freedom Trail such as Paul Revere's house and Faneuil Hall. I loved seeing all the historical sites. We went to Filene's later on - it's sort of an institution in Boston. They offer discount prices on clothes. Murd and I spent ages there and I ended up buying 3 shirts. It was a long and tiring day, so I just crashed later on. Thursday was really cold and it actually ended up snowing on our way to the JFK Museum and Library, which sucked. We went to Trinity Church. 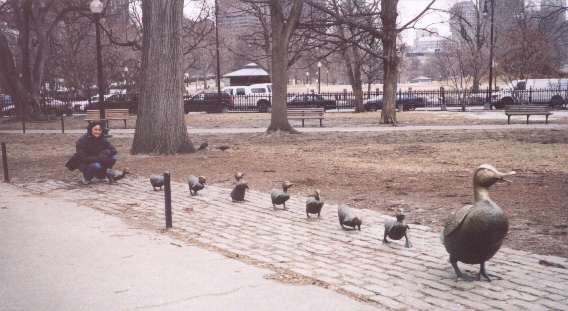 We also went back to the Boston Common to search for the Make Way for Ducklings monument. Next, we tried to look for Ben Franklin's birthplace, but could not find it. We then headed to the JFK Museum and Library which was really quite fascinating. We spent the whole afternoon there, looking at the displays and various memorbilia. I think I could have spent a whole day there. We went to TGIFs for dinner and I had one of the best steaks that I've had in a long time. On Friday we went to Chinatown and then to the Museum of Science. The Museum of Science would have been a great thing to do if we both weren't so tired. I ended up falling asleep during the planetarium show which is a shame considering I paid admission to see it. We ended up walking through most of it just purely out of obligation because we had paid about $20 US for admission. The only interesting things that happened was Murd made a comment about how these baby mice looked like little peanuts, which them made me not want to eat peanuts anymore. ("Awww...they look like little peanuts"). For dinner we endured a two hour wait and went to the Cheesecake Factory. I had some crabcake sandwich which I didn't particularly enjoy and a cheesecake which was quite good. Saturday we went to Quincy Market and shopped a bit. 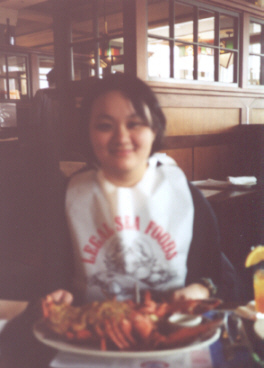 We went to Legal and I had the most delicious stuffed lobster and clam chowder. The stuffing was made of crackers, scallops and shrimp and the lobster was almost 2 pounds. It was a little embarassing though because Murd and I had trouble cracking the lobster, so the waiter actually had to come and do it for us. He literally got some gloves and cracked the lobster claws for us. We also needed help tying on our bibs which was a little embarassing as well. But the waiters were really nice about it. Needless to say he got a really good tip. Later on, we walked around the mall a bit (all the stores are really really posh) and then went to Jillians which turned out to be a bit of a disappointment. Firstly, it was in a dodgy area and secondly when we actually went in, it wasn't what we expected. So we went to TGIF instead and had some appetizers (spicy chicken) and drinks. The funny thing is I was so awake and lively and Murd was tiring out, whereas earlier in the week she was energetic and enthusiastic, while I was dead tired. So she was falling asleep while we were eating, and I was just talking her head off. We left early Sunday morning, making all those stops again. It was quite a long and tiring bus ride home. The only good things were that a hot guy sat in front of me and we managed to catch the express bus back to Toronto which saved us about an hour. I kept teasing Murd about how big and heavy her suitcase was. I would lift mine up and down like weights, while Murd struggled with hers. She did have a pretty big suitcase. Anyway, it was an awesome journey. I had always wanted to go to Boston, so seeing it all was just fantastic. It lived up to every expectation that I had. It's not a huge city, so it's very walkable. And everything there is quite posh. The only thing I would say is that you can pretty much see most of it in 3 or 4 days. You really don't need the extra day that we had there. But it's a lovely city with a great atmosphere.